If you haven’t explored the downtown Lebanon section of the Mascoma River Greenway, grab your skis, snowshoes, a few of your closest friends, and a dog if you have one and check it out. With good snow cover, this short section of trail makes for an excellent out and back winter journey on flat terrain. At the APD end, you can walk over to the new APD trails behind Harvest Hill, a sweet network of gently rolling trails designed by the Upper Valley’s own Morton Trails. “For building endurance, cross-country skiing is one of the best sports you can do,” says Stephen Olvey, MD, an associate professor of clinical neurological surgery at the University of Miami Leonard M. Miller School of Medicine. It also burns more calories than almost any other activity. Cross-country skiing is an aerobic sport. That means you move nonstop for an extended period of time while your heart pumps oxygen to your muscles, providing them with energy. “It is about grinding it out over the long haul with no help from gravity,” Olvey says. 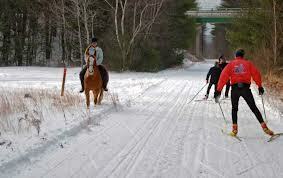 The muscles strengthened while you cross-country ski vary with your skiing style. But they typically include the thigh muscles, gluteus maximus (bottom), gastrocnemius (calves), and biceps and triceps (front and back of the upper arm). In terms of calories, a 150-pound person burns about 500 to 640 calories per hour while cross-country skiing, depending on the effort level. Don’t overdo it. Be conservative in how long you plan to ski. Prepare yourself ahead of time by using an elliptical trainer to avoid muscle strain. Bring fluids and snacks, especially if you’re heading to a remote area. Wear layers of clothing that keep you warm and allow for easy movement. Be safe. Let someone know where you will be and when you expect to return. “It wouldn’t take long to become hypothermic,” Olvey says. 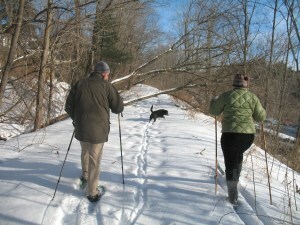 This entry was posted in Greenways for Health and tagged cross country skiing, dog friendly ski trails, health benefits of cross country skiing, lebanon nh, mascoma river greenway. Bookmark the permalink.